CeCe Prentice is a Freegan – someone who seeks to reduce their footprint on the planet by reducing waste and reusing everything possible and even digging for discarded food. As such, she’s acquainted with the manager of the town dump (where CeCe was planning to ‘shop’ for her next vehicle). When Big Bob, the dump manager goes missing and is later found dead under a load of recycling, CeCe uses her art skills to make sketches of the scene and identify potential witnesses. But despite CeCe’s uncanny ability to recall faces and draw them accurately, she’s having a lot of trouble with one individual. CeCe comes from a family that might just define the term dysfunctional. Her mother is a recovering addict. Her twin brother (who died in the previous book) she discovered was not her biological twin after all, and her father was the head of an organization experimenting with genetics and, as it turns out, stole an egg from twelve-year-old CeCe and fertilized it with a sperm cell from her ‘brother’. Now she’s wondering if there’s a sixteen year old son or daughter in the world with her DNA. As with the first book (see review here), there is some really incredible science going on. Incredible and scary. I can’t imagine the sort of psychological effect it would have on a person to know that you’ve been robbed of your seed/egg and that it was used to reproduce – that you have a child that you’ve never known about. (Okay…this does sort of, sometimes, happen to men, but not so much for a woman, for obvious reasons.) But fortunately I don’t have to imagine it as author Deirdre Verne captures it quite well. CeCe’s artistic abilities play a slightly larger role in this book, which is much appreciated. It is a mystery with the word ‘drawing’ in the title, with a protagonist with a great artistic skill, but this is still primarily a medical/scientific mystery/thriller. The artistic talents come into play with this particular story. This plot, with the dead manager and his missing wife, is the center for this particular book, and it is a worth-while mystery. It is worthy of its own focus. But the overarching story of the family dynamics with the gene research and the theft of DNA and the loss of trust is what really makes this a story to immerse one’s self within. I found this book even more interesting than the first book in the series, in part, I suspect, because Ms. Verne builds on the what she’s previously established. It’s like doing a jigsaw puzzle, only to realize that a bunch of different jigsaw puzzles, when put together form another, larger picture. I absolutely love the intricacies here. Looking for a good book? 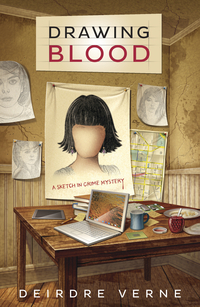 This is a mystery series worth reading, and while I would suggest reading Drawing Conclusions first, Drawing Blood still works nicely on its own.